Glass blowing is fantastic to watch, and amazing fun to have a go at! 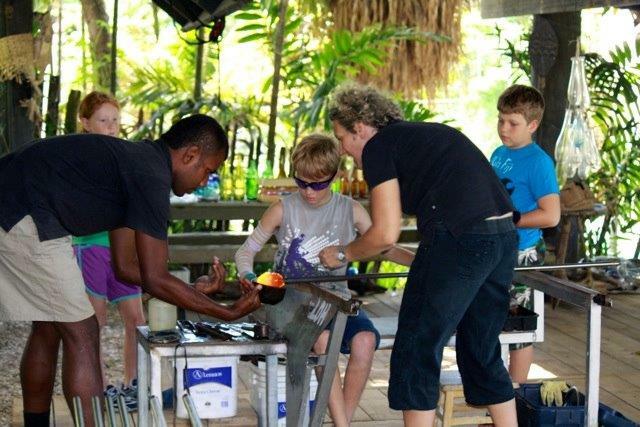 You can make your own unique glass piece, a special memento of your trip to Fiji to take home with you. Choose and apply colour, shape and make your own paperweight or blow yourself a drinking glass,vase or dish. Hot glass fun in a short time. Think up and make interesting shapes – little ones hand prints, babys footprint, a shell from the beach, iconic Fiji objects – Starfish, frangipani, war clubs, turtles, gekkoes – try a few different ideas. Basic glassblowing techniques workshop with Alice. Learn to blow, shape and colour your own unique creations. You will get to make three pieces of glass some clear glass blobs, a coloured paperweight and a blown vessel (vase, tumbler or dish). Glass has to cool down slowly from its working temperature of about 1000°C before you can pick it up and pop it in your pocket. You can collect your creations the following day or later on, or they can be delivered to local area resorts. Further afield or overseas, we can easily arrange post and packing.